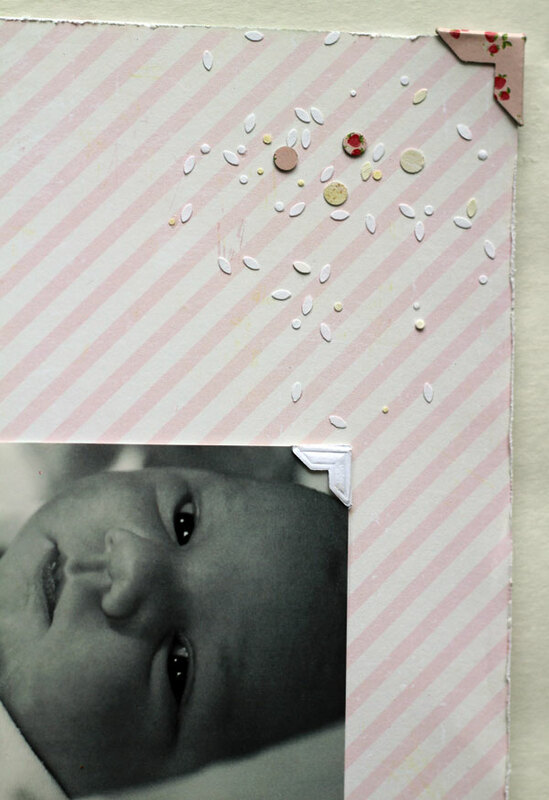 I was inspired by all of the wonderful pinks in this month's colour challenge at the Crate Paper blog, to scrap a photo about our third daughter being a girl! We didn't know if we were having a boy or girl and it was such a wonderful surprise when she was born to find out she was.... A girl! Lots of Crate Paper Pretty Party here.... the tags were all cut from a sheet of CP paper and the background diagonal stripe is also Crate Paper. So pretty! And so girly. 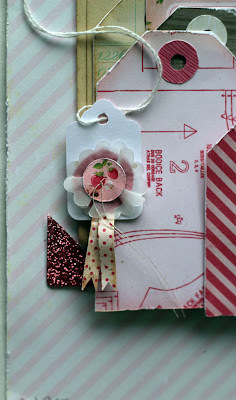 :) The chipboard tab is from the Pretty Party chipboard set. I wrote Lady Bon-bon on it, since that is what we called Ruby Sky when these photos were taken, because we hadn't named her yet! That pretty white woodgrain paper is the backside of the tag patterned paper from Pretty Party, and I think I used the whole sheet on this layout! Love it. I punched circles from Crate Paper patterned paper scraps and punched a hole in the centre to make my own pink reinforcers for the tags. I really love the delicate font of these letter stickers, also from Pretty Party. I made a little fair ribbon with a circle punched from strawberry printed Crate Paper and a scalloped piece of white vellum. The ribbon tails were trimmed from a piece of red polka dot Crate Paper. I tied a bit of thread into the centre of the strawberry paper centre. I "tied" a paper bow from the cut-off strip from one of the pieces of paper from the collection. I made a photo corner from some Pretty Party packaging, and then punched some small round confetti from other scraps. 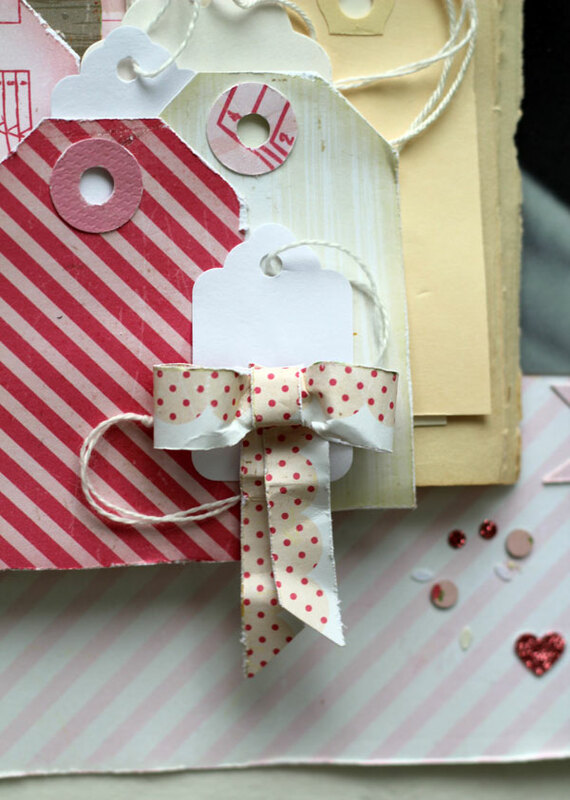 Supplies: patterned paper (Crate Paper); tags (Avery, the Paper Company, the Paper Studio); photo corners (Canson, Martha Stewart); chipboard (Crate Paper); punch (Martha Stewart, Recollections); vellum (the Paper Company); pen (Sakura). Your stuff is so incredible...that little photo corner is SUCH a great and unexpected detail! what a stunning layout. Love all the tags!!!! Really gorgeous and sweet layout - the pink and vintage style works really well. Great use of tags too! This is so gorgeous! I love your clustering and all the texture! Thanks so much for linking up with purplemailbox.com for the Layout Love Linky!!! I pinned this layout a couple of days ago! Nice to put a blogger with the layout! LOL! 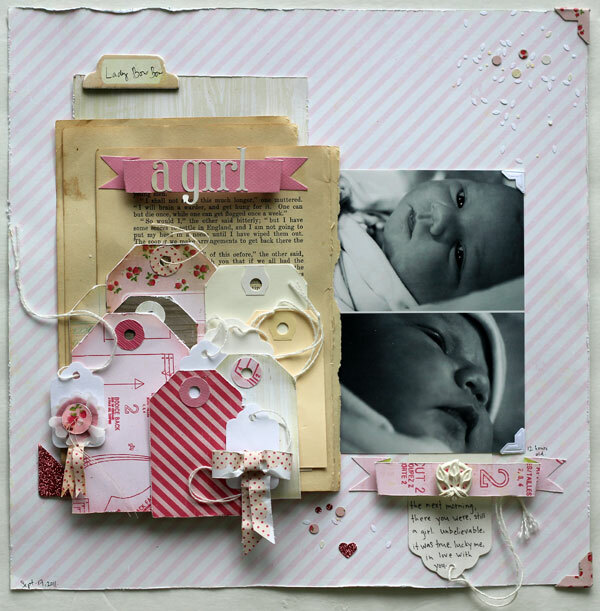 This beautiful layout is on my "to scraplift" list! 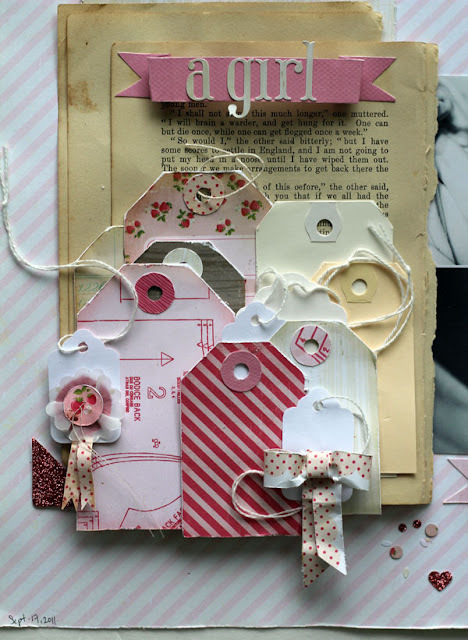 :) I always struggle with ways to use tags in my layouts and this is perfect inspiration! Thanks! OMGoodness, I love how you layered the tags!!! Beautiful layout. Loving all those layered tags! Great use of all those tags! Thanks for sharing your ideas! I'm here from soaphousemama's linky love post!